A lot rides on a real estate appraisal, especially in a low market. The home appraisal is a crucial step in getting any home sold, becoming a linchpin for confirming the sale price. That’s because most home sales contracts carry an appraisal contingency clause. If the appraisal doesn’t come in at or above the sale price, then the contract can be cancelled. Meanwhile, many buyers need the appraisal justification of the sales contract in order to validate their loan, as the lender might also have an appraisal contingency built into the loan approval. Working with a market-savvy real estate agent should be enough to make sure a home’s sale price will meet the appraisal value. But unpleasant surprises can happen to anyone. When the home appraisal isn’t enough, you have options. Don’t accept an appraisal you know is too low. Challenge it. Does a low home appraisal give the buyer negotiating power? Some buyers get excited at a low appraisal. They think they can void their contract and then get the home at the new discount price. However, voiding an existing contract is also a good way to offend a seller and risk losing the home entirely. Sellers shocked by an unexpectedly low appraisal are sure to feel cheated. They will be in no mood to be bullied by a smug buyer. Renegotiating the contract could require some tough compromises from both sides. Sellers may be forced to reduce their price, but buyers may be forced to pay more out of pocket above the appraisal value to keep both the home and their loan. Other negotiations can get creative, especially if the seller refuses to accept a lower price. If negotiations fail, the buyer could be out of luck and out of the home’s contract for good. Who is involved in the home appraisal process? Lenders, as the appraiser’s formal client, are barred from contact that might influence the appraisal. But buyers, sellers, and agents are encouraged to be present during appraisal. They can present their case, providing any information they can to help the appraiser determine the appropriate value for the home. After the appraisal, the buyer (as the client) is frequently the one that can request the paperwork for review. Sellers may also request it, either directly or through the buyer. How do you go about challenging a low appraisal? Neither buyers nor sellers have to accept a low home appraisal. Either party can hire another appraiser (or appraisers) to provide second and third opinions to counter the low appraisal. If the buyer is set on canceling the contract, some contract language could allow any low appraisal to legally invalidate it, even if other appraisals come back higher. The low appraisal itself can be challenged by providing detailed proof of the home’s value, demonstrating flaws in the appraisal process or appraisal paperwork. 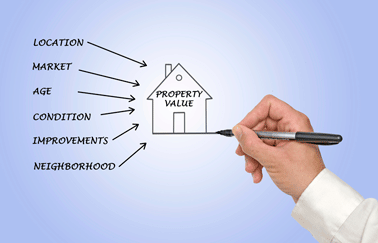 Some appraisers may be unfamiliar with the area, have limited or imperfect comparisons to base market value, or be unaware of other features that improve a home’s value. Factors like home improvements or local changes (a school redistricting or a new park commissioned nearby) could increase a home’s value. As long as the appraisal challenge is based on facts rather then opinions or emotions, there’s a decent chance of overturning it or acquiring a second appraisal to counter it in negotiations. No one has to accept a low real estate appraisal. Talk to your agent and closing attorney for advice and assistance, and take steps to deal with it. Are you considering a career in real estate? Find out what it takes to get your real estate license in our quick video below.